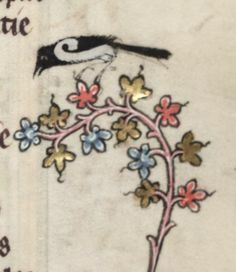 bryd one brere – bird on a briar – is the earliest surviving English secular love song with a complete lyric, dated c. 1290–1320. The music was written on the back of a papal bull with a poor pen, so interpreting the notation is problematic in parts. A previous article (available here) addressed interpretation of the music and the poetic meaning of the words. This article addresses a second problem of interpretation: the song was clearly intended for two voices, but the primary voice is missing, leaving us only with the second voice, the polyphonic accompaniment. Using the principles of medieval English polyphony, author Ian Pittaway has constructed three possible versions of the lead voice, based on the gymel, contrary motion, and the mixolydian mode. While we cannot know if any one of these constructions was the intention of the composer, the exercise serves as an illustration of the principles of English polyphony at the turn of the 14th century and an attempt to sing the song in the originally intended manner. All three two-voice versions of bird on a briar are sung in a multi-tracked illustrative video by Ian Pittaway. Putting aside the notion of being historically authentic but embracing the idea of being historically informed, the aim is to arrive at a performable and historically justifiable arrangement of the problematic song, bryd one brere, from c. 1290–1320. This is the oldest surviving secular love song in the English language with a complete lyric and so it is early music gold-dust, but it does have some severe holes: it is for two voices, but one voice is missing; and some of the roughly-written notation is difficult to decipher. What follows is not the only possible musical solution; but on this journey I’ll take you through the process step by step, so you can decide for yourself if you’re convinced. I’ll also delve a little into the background of the song, arguing that it is clearly influenced by the courtly love tradition of the troubadours and trouvères. The article starts with a video performance on voice and medieval harp.